If you try to look for the anCnoc (prounounced “an knock”) distillery, you’ll come up empty. That’s because the anCnoc distillery doesn’t exist. anCnoc expressions are released by the highland distillery Knockdhu. They use the brand name anCnoc to prevent confusion with the Knockando brand. Older versions of this release were spelled “An Cnoc” but they eventually combined the two words into what you see today. 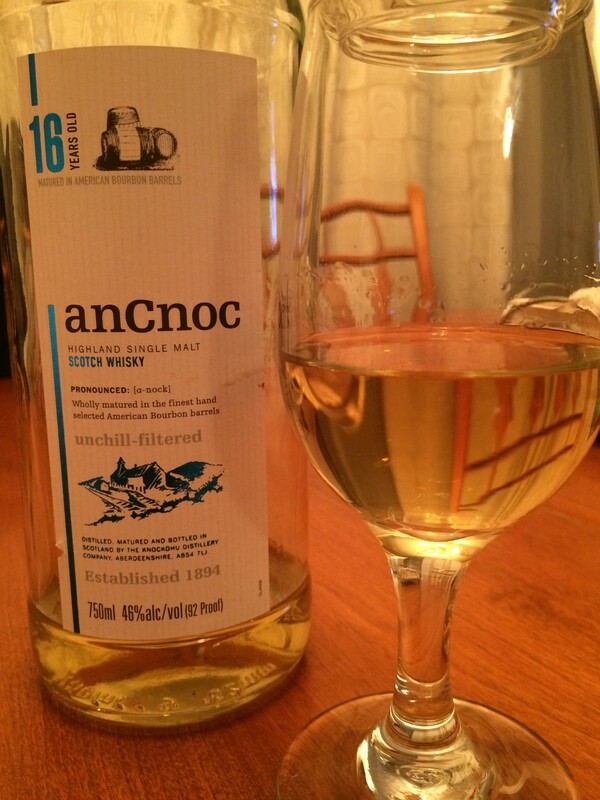 Unlike the 40% ABV 12 Year, anCnoc 16 year is bottled at 46% and is non-chill filtered. This release is aged exclusively in ex-Bourbon barrels and the natural color shows it. Even in the 2015 whisky market, all anCnoc bottlings continue to be reasonably priced, especially the older releases. Take note, distilleries. End buyers notice and appreciate this! Nose Fresh and fruity. Heavy on the citrus, lots of lemon, orange peel, vanilla, cereal, heather, other fresh cut flowers. Taste Crisp and refreshing but a nice thick mouthfeel. Again, plenty of citrus up front, lemons and limes, sour candy, sugary sweetness, heavy vanilla, hint of almond and some wood influence. With water and time, some white pepper and less sour and citrus with some orange emerging instead. Finish A burst of fruitiness and the spice that's been missing up until this point including some nutmeg and cloves. Some green apple shows up as well as some oak and vanilla. Overall Thoughts I've been calling anCnoc 16 Year the "lemonade of whiskies" for years and tonight's tasting is no exception. It's crisp, clean, and heavy on the citrus. In a sherrybomb world, this is a pleasant breath of fresh air.